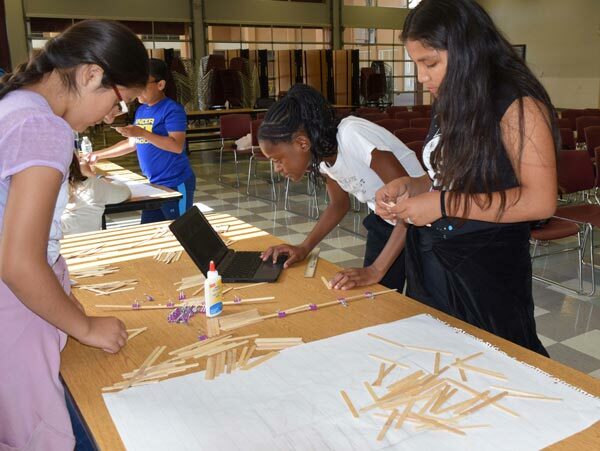 Incoming 7th grade students at Ruth O. Harris Middle School have been building bridges – literally and figuratively – in Ken Soldmann’s summer school class. A fun engineering project to build bridges out of Popsicle sticks grew out of another lesson directed at college and career readiness. Soldmann, who also works as the district’s Curriculum Specialist for CTE and Integrated Pathways, said he wants to help prepare middle school students for the future. “Before going to high school, they should be able to decide on a path to college and career,” he said. An interest inventory revealed that engineering was a field students gravitated toward. Soldmann had students conduct research about bridges, then work in teams to design and build the strongest bridge possible with 200 Popsicle sticks, glue, and binder clips. Students plan to test their designs by seeing if the bridges can hold a stack of textbooks. The project has helped to build both academic and social skills, Soldmann said. ROHMS Assistant Principal Tenicia Jackson said such projects go a long way to help incoming 7thgrade students to be successful in middle school. Xavier Spencer, who is coming to ROHMS from Sycamore Hills Elementary School, said that interacting with new people was more challenging and maybe even more rewarding than the project itself. “It was kind of hard when we didn’t know each other,” he said. Now, he will have a group of new friends with whom to start the year.